I’m so excited – I think this Vegan Baked Carrot Cake Oatmeal is the best oatmeal I have ever made. I’ve made a ton of oatmeal recipes that I’ve fallen in love with, but I think I need to make this recipe more often. It really tastes and acts like a proper Carrot Cake. Granted, the texture is a little denser, but all the flavors – including icing – are there! Oatmeal is my favorite breakfast. 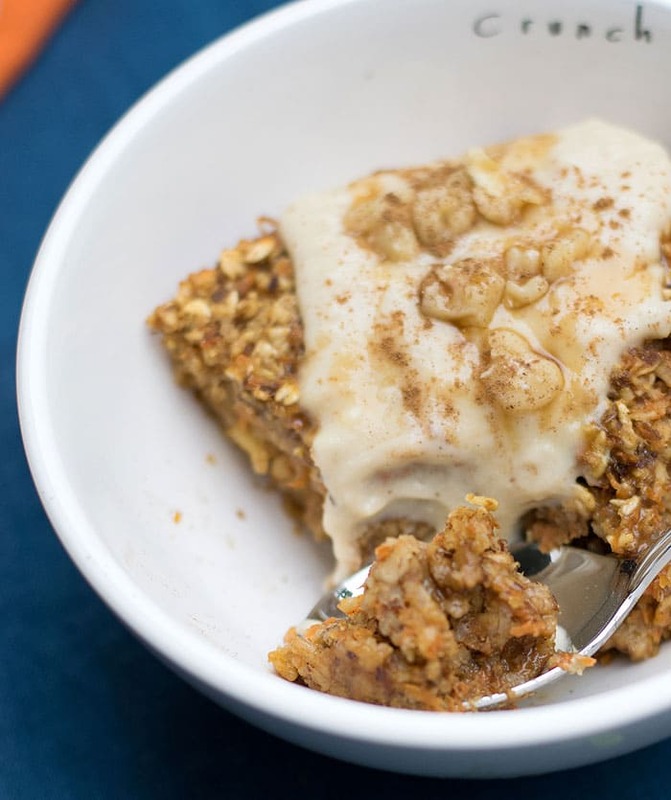 This vegan baked carrot cake oatmeal feels so decadent, but there’s even a veggie in there! If you aren’t in the mood to make baked oatmeal be sure to try my Blackberry Mojito Overnight Oats, or Orange Flower, Pistachio, and Date OatmealOrange Flower, Pistachio, and Date Oatmeal that cooks on the stove top, or use your slow cooker to make my Vanilla Fig Oatmeal with Baklava ToppingVanilla Fig Oatmeal with Baklava Topping. Just so you know this post is sponsored by Nancy’s Organic Cultured Soy. It’s my favorite soy yogurt, but unfortunately I can’t get it in my area anymore. If it’s in yours please eat some for me! They just came out with some Oat Yogurt and that would work in this recipe too. 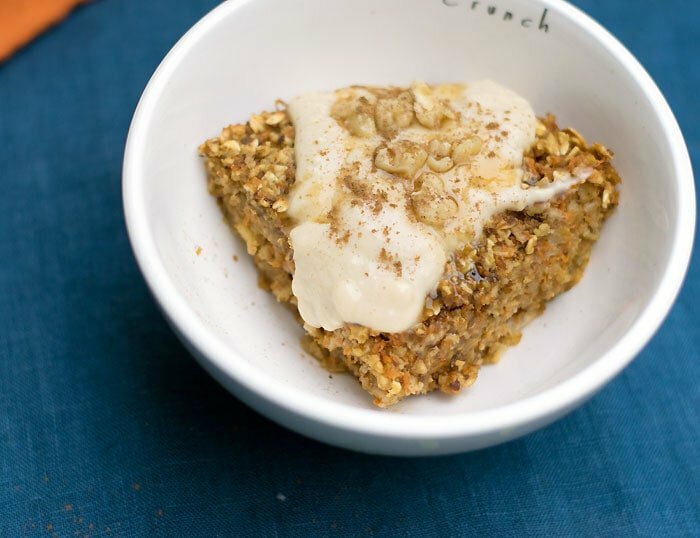 Why Make Vegan Baked Carrot Cake Oatmeal? There’s not a more satisfying breakfast than oatmeal on any morning. 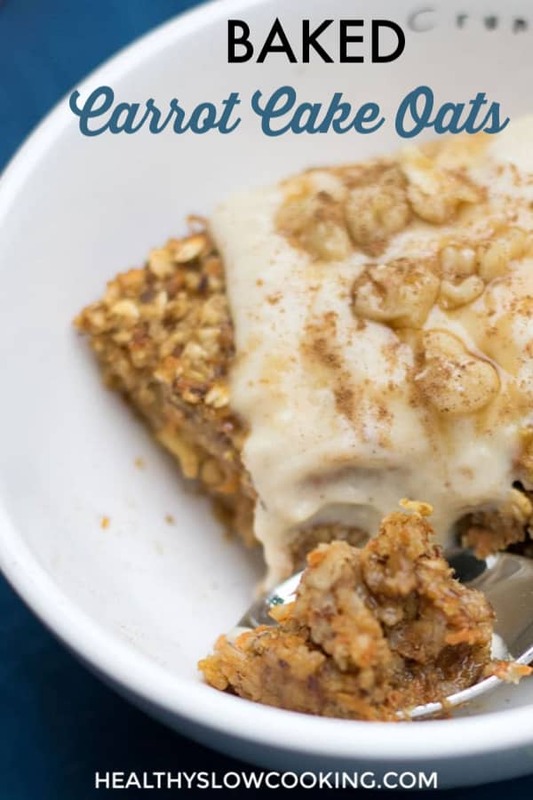 This recipe for Baked Orange Carrot Cake Oatmeal is delicious enough to serve for dessert and healthy enough you can pat yourself on the back for making it. I have to admit to eating it for breakfast and dessert! Nancy’s is a little tangier than Whole Soy was and it’s thicker too. The vanilla is sweetened with some maple syrup and the fruit flavors use organic kosher white grape juice. There is no cane sugar in any of them. Do I Have to Use Soy Yogurt? I know that some of you are allergic to soy, so feel free to use a different vegan vanilla yogurt. 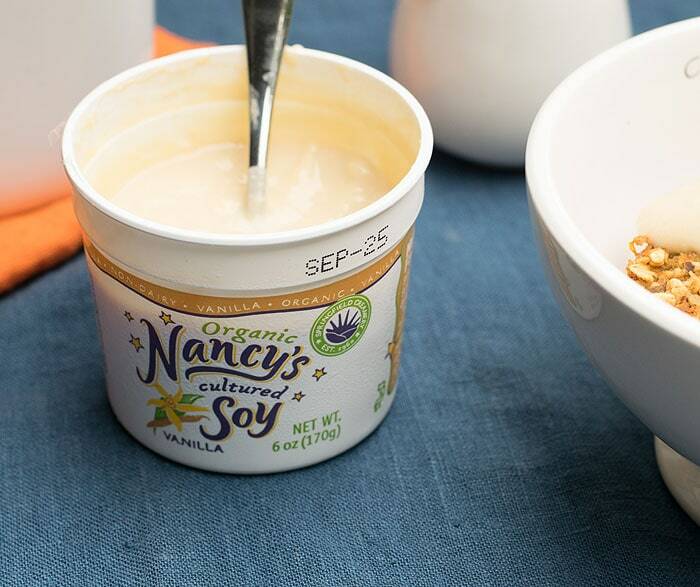 There are so many choices these days like almond, cashew, oat, and even hemp vegan yogurt. What Do I Need to Look Out For If I’m Gluten-free? If you are gluten-free, make sure that the oats you buy are clearly marked gluten-free on the package. 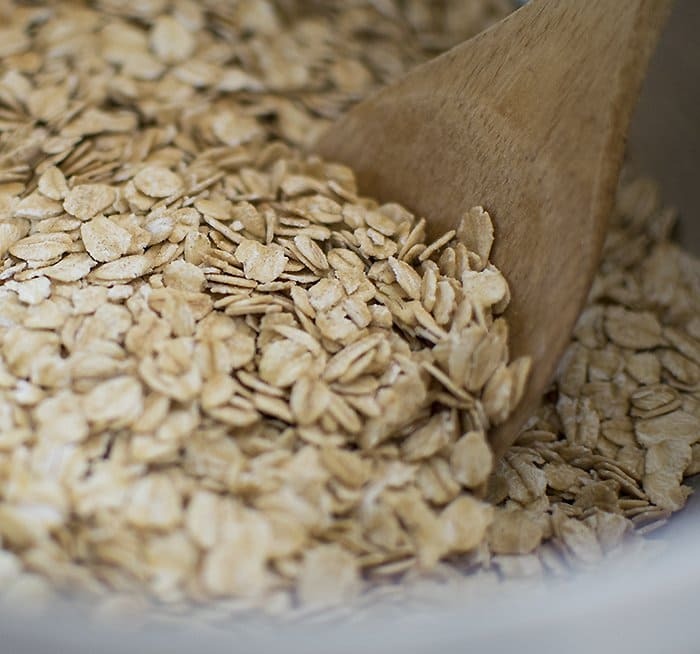 Oats do not naturally contain gluten, but they are often cross-contaminated with gluten. How Long Will Baked Oatmeal Last in the Fridge? It should last 5 to 6 days as long as your fridge is very cold. Can Baked Oatmeal Be Frozen? Yes, you could make the oatmeal part, or a double batch, and freeze it. I would not make the topping until you’re ready to serve it though. Vegan Baked Orange Carrot Cake Oatmeal topped with Nancy's Cultured Soy Vanilla "Icing"
This just may be the best oatmeal I have ever made! It's just like eating carrot cake for breakfast, but without any of the guilt. Preheat your oven to 350 degrees. Oil a medium casserole dish or line with parchment paper to make it oil-free. Pour the mixture into the prepared casserole pan and smooth it even with a spatula. Bake uncovered for 45 minutes. It will be wetter than a real cake, but as long as it's as thick as bread pudding, it's good to go. Top each serving with ½ small container of Vanilla Nancy's Organic Cultured Soy to serve as your icing. You can also sprinkle chopped walnuts and drizzle a little maple syrup to make the most impressive breakfast you've ever served your family! oh my goodness this looks so tasty! Carrot cake is my fav! This will be my breakfast today! I’ve made something similar with bananas and shredded apples, I’ll have to try this one. Love the idea of topping with Soy Yogurt! I bet that was delicious! I live alone. Can I freeze this in portions? Before I left for my trip, I frozen some single serving sizes. I will try one next week when I get home, but it should work perfectly. Just don’t put on the topping until you eat it. Veronique, good question! Kathy, thanks for already starting a freezer test. I have shredded carrots in the fridge and will try this out–I’m going to pin it to Once a Month Meal’s freezer cooking inspiration board because it’s just a perfect oatmeal recipe for fall and to make in quantity. I betcha it will freeze (not yet iced) just fine, all of the ingredients freeze well. Let us know what you find out! I’m on the fence about either freezing as a batter in silicon muffin cups to freeze and bake fresh for a short time on serving day, or prepare but under-baking by about five minutes so the heated up end product will be perfectly baked. What do you think? Thanks Katheraine! I thought about cooking it in muffin tins and think it would work fine. I would bake it before freezing and just warm it up. I like the idea of under baking it a tad before freezing so it’s moist when you warm it up. The baking time will be a little less in a muffin tin already. I’ve been having this every day! I’d love to be able to freeze it so I dont have to make every morning. When you say warm it up do you mean in the oven at 350? It will warm up fine in the oven at 350 or you can microwave it if you are in an office enviroment. Made this and it is excellent!!! This looks intriguing. Does the interior come out soggy or is it more just moist? I think I might try something like this in muffin tins, baking off a few and then parbaking the rest and freezing. In my opinion it was moist, more like a moist cake, than soggy like a traditional bowl of oatmeal. It should work great in a muffin tin! Kathy, thanks for this recipe. I have made it twice now and it is delicious. The first time it was a bit dry for me but I suspect my oven was a bit high. 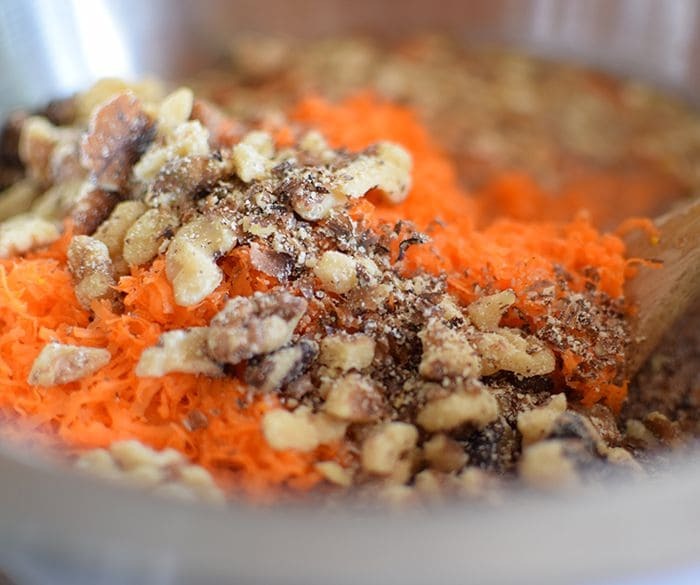 The second time I made it I doubled the quantity of carrot and also added chopped walnuts to the mixture rather than use them as a topping. I loved it! YUM! I’ve been craving a carrot cake something lately and love how easy this looks! This recipe looks delicious! Any chance I could sub the maple syrup with either apple sauce or mashed banana? I know it wouldn’t be as sweet but was thinking more about the moisture. This was a great recipe! I ended up adding more oats and baking into muffins. I did not top with the yogurt, but did add a small amount of chopped walnuts to the batter. Yum!